The Capital of Bolivia is Sucre. 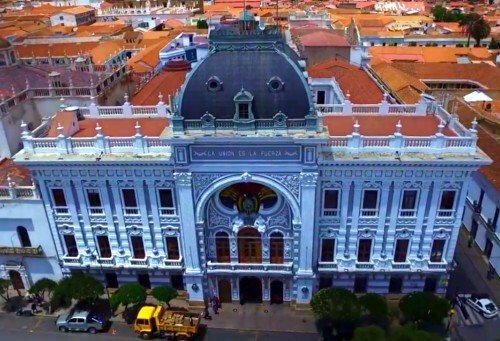 Is Bolivia's Capital Also La Paz? Find Out ! Does Bolivia Have Two Capital Cities? Why does Bolivia have two capital cities? When the Spanish colonized the Americas, they divided the continent into viceroyalties – large territories, each governed by a viceroy. Bolivia was initially a part of what was known as the Viceroyalty of Alto Peru which included what are now Peru, Bolivia, and parts of Chile. In 1825, when Bolivia gained its independence, it was founded as a Republic in the city of Sucre, in the central state of Chuquisaca, and Sucre was established as Bolivia’s capital city. During this time, silver and tin mining were the country’s largest industries. Tin and silver were being mined in Potosí, west of Sucre. A great number of silver mine owners lived in Sucre and many of the tin mining families lived in La Paz, near which other tin mines were also being run. Silver had already been mined for several centuries. Tin was a newer industry and 70 years later, had surpassed silver mining in terms of generating income. Bolivia experienced a lot of upheaval during its first decades as a sovereign nation. In 1899 Bolivia’s Liberal Party and Conservative Party clashed in a struggle for political power. Sucre’s silver owners and large landowners supported the conservatives. Tin mine owners threw their support behind the Liberal Party. The Liberals overthrew the Conservatives and immediately bid to move the country’s seat of government to La Paz. In the end, an agreement was reached. La Paz became the seat of the executive and legislative branches of the Bolivian government and the judicial branch remained in Sucre. Today Sucre remains as the one and only capital of Bolivia, per the Bolivian constitution. However, La Paz is sometimes erroneously called the administrative (or de facto) capital. If you read Bolivia’s constitution you’ll see the only capital city of Bolivia is Sucre and La Paz is considered simply the seat of two branches of Bolivia’s government. However, the government employs vast amounts of people and of the two cities, La Paz benefits most from this in terms of wealth, infrastructure, city maintenance and beautification, as well as international publicity, events, and tourism. Since 2005, there has been a movement to return all three branches of government to Sucre. There have even been several violent confrontations and protests regarding this matter over the past few years. Since Evo Morales became president in 2005 the country’s West and East have been more ideologically and politically divided than ever before and the citizens of Sucre (known as Sucrenses) proposed reinstating Sucre (which is located in Bolivia’s geographic center and has fewer than 300,000 residents) as Bolivia’s capital in order to provide some balance. This would also do much for Sucre's economy but the people of La Paz, whose economy would greatly suffer if this happened, are naturally opposed to this. In September of 2008 thousands of Sucrenses participated in protests and manifestations. The government accused them of promoting division and separatism in the country. Over 2 million people from La Paz and El Alto marched in protest against this. Sucrenses were called enemies of the state. President Evo Morales and his political party the M.A.S. (Movimiento al Socialismo - Movement Toward Socialism) swiftly drafted a new Bolivian constitution amid much protest and violence throughout most of 2008. The text for this new constitution still states, in the very first article, “Sucre is the capital city of Bolivia”. However, Sucre’s bid to actually move all government branches back to Sucre was vehemently denied during congressional debates and negotiations on President Morales’ new constitution. Sucre campaigned heavily to vote against the new constitution and four other Bolivian states (Tarija, Santa Cruz, Beni, and Pando) supported Sucre. However, the New Bolivian Constitution, proposed by President Evo Morales, was approved by a narrow margin of just over 50%. Sucre remains the capital of Bolivia and La Paz the seat of government. The new constitution was approved by only 4 of Bolivia's 9 states (all 4 in Western Bolivia) and was not approved by 5 states (in the Eastern half of the country). Even though more states voted against it, the new constitution passed because the states that voted to approve it are more populated and have more voters.